Some modifications prevent problems in the future. Generally, they are repairs done to reinforce. For example, reinforcing a trigger before it breaks can and will prevent that from ever happening. Common problems with certain water guns are listed in their reviews. I suggest fixing those problems before they need to be fixed because you likely will never have to worry about those problems again. If a part is prone to breaking or you don't want to take any chances, you can reinforce it. If the part is pressurized like a valve, typically that means coating that part in epoxy for more strength. Other things like reinforcing a trigger on non-pressurized parts will prevent that from breaking. Some parts, like pumps, require lubrication to work best. Vaseline (petroleum jelly) lubricates very well. 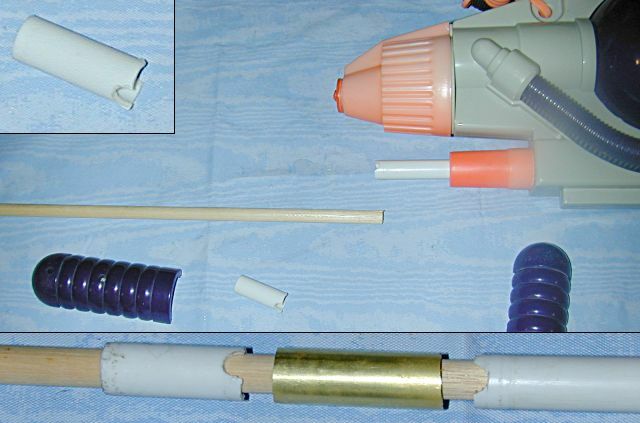 However, most rubber seals in water guns are natural rubber and are best lubricated with something other than petroleum jelly, such as a silicon lubricant. The natural rubber and petroleum jelly react. However, in homemade water guns, O-rings are usually made from Buna-N rubber, which is perfectly acceptable with petroleum jelly. Look up chemical compatibility with the lubricant and pump seal if you are unsure. Afraid your pump is going to snap? Well, it could. You can reinforce it by sticking a dowel rod of the appropriate length down the hollow part. Metal dowels are strongest, but wood is acceptable too. I highly recommend reinforcing pumps. The image above is from a snapped pump repair job, but it shows a dowel rod in the pump rod. Lubrication can help improve seal, but you can also put a few wraps of electrical tape around the flat part of the pump where there is no seal to improve seal as well. Try to find the number of wraps that can stick in the pump shaft relatively snug. Generally this is not necessary because pumps do not leak, but if your pump does leak a bit, I suggest using electrical tape to help improve seal. As always, lubricate the electrical tape too.